And Jesus said, "where two or three are gathered together in my name, there am I in the midst of them." There are many wonderful prayer groups available to pray for Priests. The Lord can lead you to the one that's right for you. 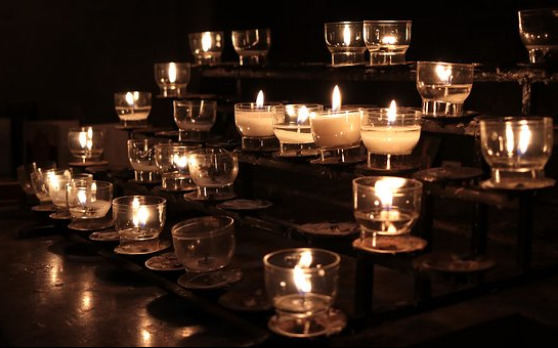 Our P4P (Pray4Priests) Prayer Groups were started in order to give busy people an opportunity to pray for Priests with a group, but for whom time constraints had prevented them from participating in the past. P4P Prayer Groups meet once a week before or after Mass to pray specific prayers (mostly Scripture) for five minutes or less. The prayers have a particular focus on supporting the local Pastor. Pick a 5 minute time block before or after Sunday Mass that will consistently work for you on a weekly basis. There is a different prayer for each week (see section called "Pick a Prayer for This Week" below). Each prayer focuses on a different aspect of support for Pastors - for example: "that he will be given strength in his vocation", "that he will be protected when dealing with difficult situations", and so forth. Ask 1 or 2 other people to join you at your prayer time, to offer prayer cover and support for your Pastor. That's it! New prayer for your weekly prayer time are regularly posted below. If a topic isn't "clickable", it means it is pending and will be uploaded by the next weekend. To open a prayer below, you can do one of two things: 1) put your mouse on the topic and RIGHT click. A drop down menu will appear and you can select to open the prayer in a new tab or in a new window. 2) or, if you want to save the prayer, put your mouse over the topic below and LEFT click to download and save the prayer to your smartphone or PC. You can then pull it up from your device and pray it at a later time. Why do you recommend having the prayer time right before or after Mass? All Catholics are obligated to go to Holy Mass on Sundays, therefore, it should be the easiest time for anyone to meet for 5 minutes or less for prayer. However, if before or after Mass won't work, pick any time that works best for you. Why is the prayer time short? Spending much time in prayer is wonderful, and many prayer groups for Priests are structured to be 30 minutes to an hour in length. However, we realized that time constraints sometimes prevented people from being part of prayer groups to pray for Priests, so we wanted to offer an alternative to help the time-challenged. The Church affirms that effective prayer doesn't have to be long (the Lord's Prayer can be prayed in less than a minute). Rather, the Lord reminds us in Scripture that key components of prayer are coming together in Jesus' name (Matt. 18:20), consistency in praying for our siblings in Christ (Eph. 6:18), and persistence in prayer (Lk. 11:5-13). The P4P Prayer Group model strives to follow these guidelines. Can a parish have more than one P4P Prayer Group? Yes, that's actually preferable! The goal is not to grow one group really large (although that's great if it happens), but rather, our format is meant to help reduce or eliminate the scheduling problems that often come with larger groups, and hinder participants from regularly coming together to pray. By keeping the format open to several small groups of "2 or 3 gathered in" Jesus' name, virtually anyone can participate and find a convenient time to pray. What format should we follow to lead the prayers? Whatever works best for you! There can be 1 prayer leader, or people can take turns leading the prayer each week, or everyone can pray that week's prayer together in unison. Why are the prayers mostly Scripture? Why should I participate in an intercessory prayer group for Priests, and in particular, for my Pastor? Because it is an act of love, mercy, and fellowship. The Catechism of the Catholic Church, drawing from Sacred Scripture, teaches us that "Intercession is a prayer of petition which leads us to pray as Jesus did. He is the one intercessor with the Father on behalf of all men...He is able for all time to save those who draw near to God through him, since he always lives to make intercession for them. The Holy Spirit himself intercedes for us . . . and intercedes for the saints according to the will of God. Since Abraham, intercession - asking on behalf of another - has been characteristic of a heart attuned to God's mercy.